VANCOUVER, BC / ACCESSWIRE / March 25, 2019 / Unity Metals Corp. (the "Company") (TSXV: UTY) is pleased to announce that, after completing a detailed compilation of historic data, the Company has identified three target zones at the Margurete claims: the FB Zone, The Eastern Zone and the Western Zone. Unity Metals Corp. is a Vancouver-based gold exploration company. The Company controls a 100% interest in the Margurete Gold Project, which covers 678ha of mineral claims, located in the Phillips Arm gold camp, approximately 200 kilometers northwest of Vancouver in southwest British Columbia, Vancouver Mining Division. The project is on trend with the historic Doratha Morton and Alexandria gold mines, which were active in the late 1800's. 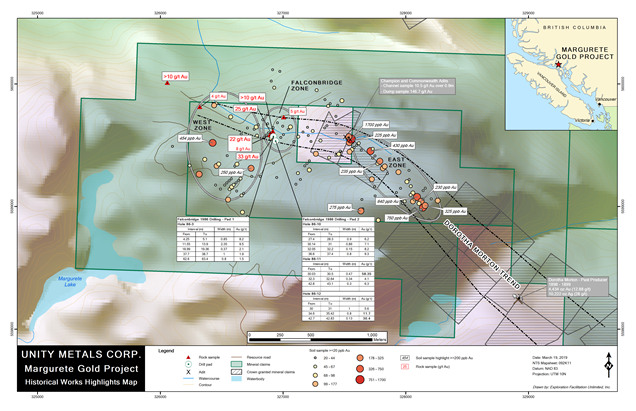 The Margurete project was last explored in 2015 with property-wide prospecting, mapping and rock chip sampling run in parallel with a targeted diamond drilling program. The primary target at the Margurete Gold Project is the FB Zone, where Falconbridge drilled multiple gold bearing intervals at shallow depths. For more information, please visit www.unitymetalscorp.com. 15.04. Noch in der Karwoche werden nach spektakulären News neue Höchststände erwartet!